Larry Harney has been working with bog oak for over 25 years. A native of Wexford with a strong hurling background, he settled in Kildare over 30 years ago and still longs for hurling success in Kildare. As with his sculpting, Larry regards hurling as another unique art form. Larry first came across bog oak in Foxhall near Loughrea Co. Galway. 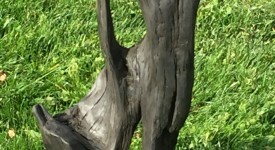 Some ground was being reclaimed and these incredible pieces of bog oak were unearthed. Larry was fascinated with what he saw and began learning more about bog oak, how it was formed and preserved, and knew immediately that he wanted to work with this uniquely Irish of materials. Larry has been sculpting and working with bog oak ever since. Larry works with the natural shapes in the wood rather than sculpting very definite outlines or figures. Art is man’s expression of his joy in labour. 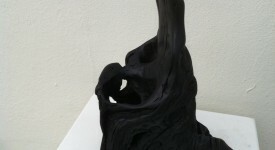 His unique and artistic approach is to allow nature decide the shape of each sculpture. Larry does not use templates or hack bog oak pieces into shapes that he wants. He follows nature’s lead and fashion what it has formed. 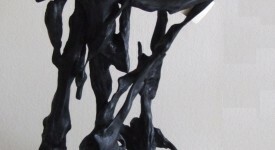 This approach preserves the unique heritage and history of each piece, and guarantees that every one of his sculptures is unique. Larry is always very grateful and appreciative to his creator at the moment when he has completed his piece. Every one is always very special, considering the age of this amazing wood. 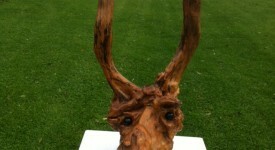 Larry’s sculptures are a unique and personal gift for Retirements, Weddings, or any special occasion. They can take pride of place on mantle pieces or be focal points in lobbies or outdoors, in gardens etc. Larry can also create mantel pieces in bog oak or bog yew. 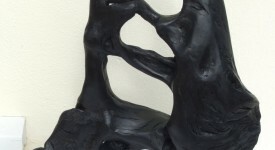 Larry’s sculptures are installed in a variety of locations – For example, in Intel’s facility in Leixlip, Co. Kildare, the exclusive K Club Hotel and Golf Destination in Straffan, in the offices of the Health Services Executive in Dublin, in Credit Unions and elsewhere around Ireland and England. The Garda Siochana presented one of Larry’s sculptures to the New York Police Department during their official visit marking the tragedy of 9/11. World-famous National Geographic Photographer Paul Clarke also bought one of Larry’s pieces during his visit to photograph the Bog Bodies at the National Museum. Larry’s sculptures were also mentioned in the article that Mr Clarke subsequently published in National Geographic magazine. 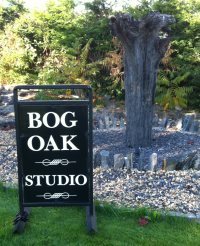 The Bog Oak Studio on the Dublin Road, Clane, Co. Kildare is open to visitors to view Larry’s recent works or purchase from the wide range of very special, once-off pieces he has available.